What Type of Motor Oil? 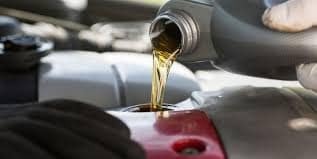 What type of oil is better for your vehicle’s engine, synthetic, conventional motor oil or a synthetic blend? Check your Owner’s Manual to see what the manufacturer recommends. For example, Kia recommends a synthetic oil blend on all of our late model vehicles. If you do have any option and wish to choose this is a brief summary of each type which may help you decide. Conventional motor oil is derived from crude oil. It needs to be changed more often every 3-5000 miles. It is generally only used on older vehicles. The cost difference between conventional and synthetic blend is nominal. A blend of synthetic and mineral oils was introduced by Mobil and was engineered to offer benefits similar to synthetic but at a lower cost. Many consider synthetic oil to be better for your engine. It has fewer impurities and added lubricants. It is more efficient and may prolong the life of your engine. It tolerates high temperatures and continues to flow in even the coldest temperatures. It is more environmentally friendly. All of this comes at a cost, synthetic oil may cost 2-4 as much as conventional motor oil. Oil changes are less frequent, perhaps every 7500 to 10,000 miles or 6 months. 0 comment(s) so far on What Type of Motor Oil?